We double checked the episode count on this one, it looks like it is 36 episodes, possibly? If so, then next week is the last week! I wanted a little bit of reprieve for our main duo this episode, but with only one week to go the writer might not give it to us. Ack! Today will be just like yesterday where we stop after about 30 minutes for a meeting and then come back to finish it. Be sure to check twitter for updates! JG – Jung Woo, your son grew up like this…. JG is at the nursing home as a lot of men are holding Nam SHin’s father back. You shouldn’t do this to me! You shouldn’t do this to me, I am having a hard time between you and the chairman. Let’s talk, you and me! All the men holding the father leave. My sons mom went to a speech, after she finishes, I will leave the country with her. Why did you do it? People will laugh at us if the 2nd generation cheabol is the whistle blower. Give me that data. Did you kill him because Abogi asked you! No, I didn’t! I did not know the chairman would go that far. But you shuold excuse what he did as his son. No, as a son, I cannot do it! I don’t need a company that kills people. People who have everything as different…you can jut throw it all away. I worked as your friend and secretary. you can come back to your position all the time. But if i lose this position, then I am dead. Just give me the data! The appa tries to walk away from JG, but JG grabs him for a moment, then leaves. Appa looks at the pictures of Oh Rora and Nam Shin. Then he goes to the window and stands on the ledge. It looks like he is trying to escape. He precariously walks the ledge to the other side, but he slips and falls to his death. JG is walking outside at the time and hears Jung-woo fall. He runs to his side. Jung-woo is still alive gripping the photo of his wife and son. JG calls 911, but he changes his mind. He starts to choke Jung-woo? No, he doesn’t choke him, he just stands over him waiting until he died. he dies quickly and closes his eyes. Later on, the chairman asks him what he is doing. JG tells him that if he goes to jail, it is not the end. How you hospitalized your son and killed Director Kim, I know evereything. You and me all did this for PK Group. Jung-woo will not come back, but you shuold save PK. VO – If I close my eyes once (ignore it) then that seat is mine. He takes little Nam Shin from his mother. He has Nam Shin run over by a truck. VO – If I am cruel just one more time…. He gives the recording of Nam SHin’s father to Nam Shin. he tells him that the chairman will kill him, just like he did to his father. Cut to the rooftop scene where NS3 holds the chairman by the neck. This is exactly what JG wanted. Shin’s computer all of a sudden says ACCESS DENIED. he is still in the car and is wondering what happened. On the rooftop, NS3 holds SB and apologizes for taking so long to hug him. She tells him that she thought something really bad would happen to him. She was so scared that he would not come back. You were bad……you were bad….she sobs as she tells him this. YH comes to the rooftop and sees Halabogi on the ground. He runs to halabogi’s side and asks what happened. SB3 says he is sorry, halabogi is like that because of me. SB says it is not because of him, it is because of Shin. halabogi starts peeing on himself. NS3 tells them all that he has dementia, real dementia. YH tries to lightly shake halabogi awake. He wakes up and wonders why he is like this. YH tells him that they have to leave right now. JG overhears all of this. He does not look the least bit sad but says that dementia is too cruel. Downstairs, Shin is still trying to figure out what is happened with his manual control. But then he sees NS3 walking with SB outside and throws his computer. Then he drives off in a rage. SB tells NS3 that she is okay. NS3 is a good peson, that is why you came back. You are a good person that hugs people who cry. That is why you could overcome manual mode. NS3 wants to go to the hospital, but SB says she wants to go home, she would rather walk home with him. Let’s go. They walk hand in hand. Later on, Halabogi is in a wheel chair in his house or the hospital, not sure. Halabogi has everyone leave and then talks to YH. He asks where Shin is. He tried to kill me, he can’t show up easily. YH says he knows it willbe hard to forgive him. But he will make him kneel in front of you. halabogi asks him if he thinks Shin is good enough to take his place? But then he says that he is tired, step out. YH tells him, don’t you think you are the one that made Shin like that? he bows and leave. Later on, HY asks if Shin caused a lot more trouble? Is he hiding? Cut to Shin drunk and passed out on a couch in an expensive looking place. JG wakes him up. Shin asks if he is going to bragg because he is staying in his place? KJG laughs and says of course not. But please come out. There is a doctor outside to meet him. The doctor tells him that the chairman is very tired mentally, he has dementia and for dementia you need very good mental support. After he got his diagnosis, he was looking for you first. he doesn’t say it, but he is waiting. Shin – He is looking for me first? JG – You should step out first doctor, he will go see the chairman soon, he is just in shock. The doctor leaves. JG tells Shin that he called doctor Lee because he needs to know what is going on. As soon as he had the diagnosis, he called the robot, not you. Even though he knows he is a robot. Shin – Are you going to instigate me because halabogi did not die as you planned. I know you want to use me. JG – Be angry later and visit grandpa now. Before he gets worse, he will announce who it taking over the company. You should prevent the seat from going to a robot. If you need any more help, then tell me. Let me save you this time sicne I could not save your father before. Shin pulls out his phone. He checks his voice mail. Someone asks where he is, if I find you I won’t leave you alive. then another message is from his mother, but all she says is, SHin…it’s umma. He throws the phone down. Elsewhere, David tells Oh Rora that her son tried to kill someone. Umma just talks about how NS3 came back to himself. David says that he was able to do it by oversiding *something* and then doing *something*. But then he tells Oh Rora that they should leave and live like before. Your son does not want you. Oh Rora does not want him to shake her. But he asks if she is really worried about him? Later on, IT and RC from the gym try to get new members. There are a lot of woman around NS3 as he stands on a box. They are basically all like, this guy will train you, so sign up! But SB shows up and tells everyone to go away. Then she tells IT and RC that they will die by her hands, go eat at home. The two run away. SB and NS3 walk away. A little boy accidentally runs into NS3 and starts crying. NS3 just looks at him, it looks like he is still affected by what happens and walks off. SB comforts the little boy andlooks at NS3 walking away. NS3 calls Grandfather and apologizes, but grandfather tells him that he knows it was not him. He wants NS3 to come back because he is the only one that can make M City a reality. But Shin grabs the phone away from him. Aunt calls YH and tells him that Shin is with grandfather and locked the door. Inside, Grandfather tells SHin that he tried to kill him. But Shin tells him there is no proof; the robot tried to do it, not him. Grandfather calls for help, but the door is locked. Shin presents a contract to him to give him all his stocks. Sign it. But Grandfather will not sign it. Not to him. Shin asks who he will give it to, that robot? Do you think the robot that tried to kill you will protect you? YH and Aunt were able to break in. YH pulls SHin out and then punches him outside. He asks him how far he will go. Shin tells him that he tried to kill his grandfather, he can do much more. YH just sighs and tells him that he is not like this, don’t be like this. Shin stands back up and tells him to stop making him feel like a little boy with a broken heart. How much do you think the company will be if we sell it? Do you want me to hit you more? Hit me more and be on my side. When you hit me, it is for me…..I am going to send him to a nursing home like my father. I want him to die lonely over there. You don’t even deserve to be hit, why did you wake up? YH drives off from the house, disappointed. Shin watches him leave from the balcony and takes a swig of alcohol. he goes inside and broods on the couch, then calls someone. he calls JG and tells him that he will give him a chance to recover his mistake to prevent his fathers death. You should help me from tomorrow. JG thanks him but Shin hangs up on him and drops the phone on the table. Umma comes in and asks Shin if he called JG? Shin tells her that she is here in this house also? Are you here to lecture me? Umma tells him that what YH said is true, you went too far. SHin thinks about what JG said, his father died trying to see him and his mother. If your mother finds out then she will be surprised. Umma tells SHin that he is becoming just like him. How can you ask help from a person like JG? Shin tells her that people like him are the only people helping him. She sits and tells him that he should go to Czech with her. If you don’t like me, then just hide from me in the house and eat and sleep. You can go out when you want. If you want to go there, just go there with your robot. No, I am not leaving without you. One time is enough for me. He just smiles and drinks. Don’t drink, it is not so good for your injury. If you really care about me, then please remove him right now. NS3 cleans the gloves while he is at the gym. SB watches him and asks why he works so hard at everything. Can’t you do just enough. But NS3 tells her that doing jut enough is not his principle. He thinks about what the chairman said about how NS3 should come back to him or else Shin will kill him. SB asks him why he did not follow his principle and hug that kid earlier. Shin says that he is not sure if he should follow his principle all the time. It is hard to make that decision. SB tells him he is lying, but then they talk playfully about how she has a screw in her leg so she is a robot as well, they are a robot couple. They laugh about it, but outside is Umma, watching them. She longingly watches their discussion and then leaves. JG – You should sign these seperately. halabogi is in a room with Shin, JG, and another man. They are all signing paperwork. the man says that he will put the signuture on for the chairman. Shin laughs and goes to his grandfather. Shin – Listen to me, Halabogi, because of your dementia now, your life feels empty. you decided to go to a nursing home after giving your company to your grandson. you will say that if anyone asks? The stamps are put on all the paperwork. Shin tells them that they are all done with this. So live there very quietly as if you are dead. JG smiles at the chairman and bows smugly. He says he was happy to serve him, but for now he will serve his grandson. Halabogi is wheeled out. JG turns and asks Shin if YH called him? It seems like he is not on your side anymore. If he knew what happened to the chairman, then he will not come back to you. From now on, rely on me, not YH. i will make sue that you become chairman without any trouble. Shin looks at Halabogi leaving, he is helped into the car. Aunt tells her father not to leave, she can take care of him. But Halabogi says he will leave. Aunt is worried about her and her son though, she is afraid of Shin. halabogi turns to Yena and tells her that he does not have bad feelings toward her, be healthy. Aunt asks Yena if she is happy that her father and Shin destroyed her family. Yena looks like she is not happy about it. But then JG comes up smugly and tells HD to tell her mother to sign the paperwork. Aunt tells him that she will do as he asks, don’t threaten my child. YN apologizes to her and then tells her appa to stop. Why are you even threatening a little boy? the aunt and son go inside. YN tells her father that she will not just let this happen. She walks away and calls someone while still oustside. She calls YH and tells him that Hlabogi just left. But Shin is not coming out. he did not even send grandfather away. YH thanks her for this information. YN tells him that she trusts him, just please send my oppa back to me. YH goes to halabogi and apologizes. This is all his fualt, he could not stop Shin. But Halabogi says he is thankful that he came. YH takes over pushing Halabogi upstairs and goes to his room. SB and NS3 are in the room. Halabogi is stunned by NS3 for a moment, or maybe just startled. NS3 remembers trying to kill Halabogi and is a little sad, he takes a step back. But it looks like Halabogi is actually happy to see NS3 and puts his hand out to him. NS3 slowly takes his hand. Halabogi starts crying so NS3 hugs him. Later on, NS3 talks to YH. he says that human Nam Shin asked JG for help? I did not expect that. YH explains that JG will use SHin very cunningly. When he gets what he wants, then he will ditch Shin. We need to stop Shin from being destroyed more. i do not, can you help me? No, human Shin told me that I do not have fee will to dissapear, I am a machine that can hurt people. I was about to kill halabogi and SB who I care about a lot. It seems like you have trauma. Trauma, did I get hurt. It is not only Shin’s fault. I knew you would get hurt, but I thought you would be okay since you are a robot. So I ignored it. I am sorry, I asked you too much. I will try to do it by myself. Don’t forgive Shin. Sorry, helping humans is my principle but I cant help you right now. You are not just a machine. SB waits downstairs for NS3. He goes downstairs and takes her hand, they walk away hand in hand. She asks him what they talked about. He tells her it was nothing special. But SB tells him that he has to tell her before she takes hr heart back. NS3 tells her that human Nam Shin is working with JG now. He asked me to help him, but I refused it. Because helping humans is my principle. But you dont’ know if your principle is good or bad. Will you still make decisions in front of a dying child? To me, halabogi and that dog Nam Shin are all bad. But i you help YH, then I will let you do it. Why? Because helping people is a good thing. I can’t do it, but when it is right, you do it. That is you and I like your principle. So don’t be depressed. You are a robot, there is nothing wrong with you being a robot, don’t hide. SB – HEY EVERYONE, HE IS A ROBOT! NS3 – Don’t do that, what if something happens to you? Nothing will happen to me, becuase I am nest to you. They happily walk through the lobby. Cut to SB and NS3 sneaking into the Mansion. In his room, HD tries to get a cell phone that was hidden from him. Shin comes up to him sternly and tells him that he shouldnt’. HD cowers and says he is sorry, but Shin is actually NS3, he tells him that it is hyung. You have a pacemaker so you should not have cell phones near you. HD says it is robot hyung, not bad hyung! Umma runs down and grabs her son. She tells him not to hurt her son! But HD says this is not the bad hyung, this is the good hyung, he rescued me. But Umma does not know that there is a robot so she is a bit confused and asks when Shin c \hanged his clothing. JG and Shin get out of the car. JG tells him that today is the day to go to the chairmans office. But YH shows up and tells him that he should not. He should be patient and follow the right steps. Shin looks at YH and tells JG to go to his old office, he needs to talk to YH. YH and Shin go to talk. Shin tells him he left as if he would never come back, why is here there? YH says he thought about not coming back, why are you here? Shin says he sent halabogi to a nursing home. YH tells him that he makes mistakes, he even makes them when he is around. You break down or I will get tired, I will go to the end. But let’s go see the chairman. If you are angry, I will drag you there, okay? Cut to Shin going to his old office. JG is waiting there. JG asks why YH came back, is there any purpose? He is nto someone to come in and out. Shin – Why? You can’t do what you want with him? When I ask for your help and you give me help, but you want to destroy me. Are you getting uncomfortable because it will not happen? JG – Do you still suspect me? I will support you until you trust me. I will gather up everyone for teh board meeting and announce that we will hav a new generation. i think you will have people that support you. Do you have anything you want to announce there? Shin – I will think about it. JG says he will expect it and leaves. Shin thinks about the new plan….is it the city that Halaboi talked about, M City? He goes to his team and talks about M City. The city were people will never die, that M City. Please make a plan about it. CJ tells him that they are already working for Em Car so it will be hard with Em City (Maybe it is Em City and not M City). Shin basically tells his team to do all that it takes to make it happen. Work overnight and everything. The team is all like, you told us not to overwork and spend time with our family. But Shin tells them that what he wants now is for them to work. Your time belongs to the family. The team go out for lunch and talk about how Shin has multiple personality disorder or something. they all grumble back and forth about that. YJ looks like he deeply wonders about it. Later on, SB3 walk in front of JY. He tells him that his lunch is late, he told him to keep his lunch time. Then he smiles. Cut to Shin meeting with SB at a cafe, he tells her that it was successful. Then he feeds her happily. Meanwhile, YH talks to someone about changing contracts, he will send him the details, come to the countryside. He hangs up, behind him is JG watching him smugly. JG walks up to him and tells him that he came back. It is unexpected. I thought if you knew I was working with SHin, then you would graciously leave. YH tells him that JG does not live graciously, so why should he? JG thinks YH is different from him, not everyone can live like him and suspect everyone. You are not like that. Why are you pretending to be a bad guy, what are you hiding? YH – I am also interested in what I am hiding. He walks away. JG smiles and mutters that it is getting more interesting. David has the kill switch. he walks out of the server room and right into Shin. Shin asks him what he is doing, was there any trouble in the server room? David asks him how he knew they had a server room there. Shin tells him that of course he knows, he will be the owner of the company soon. if something happens, then let me know. If you let me in then I will help you. Even though this is your company, you cannot come in. I can borrow my grandfathers finger, or I can destroy it. You have become so bad. It is so pitiful to your mother and NS3 who work so hard for you. I saw you for 20 years. I am the one that took your picture and gave it to your mother. Because of that, I saw how you grew up. Do you know why your mother made him like that with the lie detector and his principle to hug when someone cries and disaster mode and surviving in water. Doesn’t it remind you of anything?…..
Shin – What do you want to say? David – You hate lies…when mom cries, hug her….you like to swim with mom…you wanted to be a firefighter….that is you. She missed you so much, that is why she put those functions in him. Don’t make fun of your mothers heart anymore. She love him, but that means she loves you. David walks away. Shin takes all that in. Cut to JG and David in their car. JG wants him to turn the car around and go to where the chairman is staying. He goes to the hospital and walks up and down the hallway as he looks for the room. He gets to the room and peaks in. YH is talking to Halabogi. YH – You deserve where you are right now, why did you like your life like that? You took someone elses things, but if someone else takes yours, then you destroy them. Whenever you slapped me, do you know how humiliated I was? I felt like an animal, not a human. I am going to live well with Shin. You should stay here quietly. Shin will come here soon. Don’t tell him that I told you this. Shin walks down the hallto the room. JG has just enough time to hide. Shin goes into the room and JG walks away happily. SB peaks around the corner and goes inside. It looks like that was all a trap. YH asks if JG left. She tells him that they really tricked him, he should not know that it is a trap. YH tells NS3 that he really looks like Shin today. NS3 smiles. The lawyer comes in so NS3 changes his happy go lucky look back into Shin’s wet blanket. The lawyer asks him how he would like to change the contract. NS3 tells him that he does not care, just talk to YH. Meanwhile, Shin is back at home brooding on his c=balcony as he thinks about Davids words. He calls his mother, she answers right away. Umma gets ready to see Shin in her room. She tells David that she feels anxious about it. It is all pretty sudden. David tells her that it is sudden, but it is a good thing, maybe he has something to tell her. JG stands to read what is going on at the board meeting. Umma shows up in the audience. All the key players are there. JG welcomes everyone and tells them that today is an important day where they change the generation of their group. Sadly the chairman has dementia, so the next person to replace him is Nam Shin. YH slowly looks over at Nam Shin, Shin nods at JG, approvingly. JG continues talking about how Shin is putting everything on the M car and Medical city. (Em = emergency or M = medical, not sure). SB comes in as everyone claps. JG finally says he is introduction Nam Shin. But YH stands up and says just a moment. Shin wants to know what is going on. YH tells them that another Nam Shin introduced the medical car. Shin yells, HYUNG WHAT ARE YOU DOING! NS3 comes in to the room and walks down the aisle. he walks to the stage and walks right in front of Shin. NS3 – Hello, I am the AI robot Nam Shin 3 who launched and planned the medical car. He bows to everyone in the audience. then he turns to Shin. They have a stare off in front of everyone. OMG!!!!! He is coming out as a robot! I love that! I hadn’t thought about this show as a show with Pride undertones before, but these last several episodes definitely give me an equality feeling about not hiding who you are. 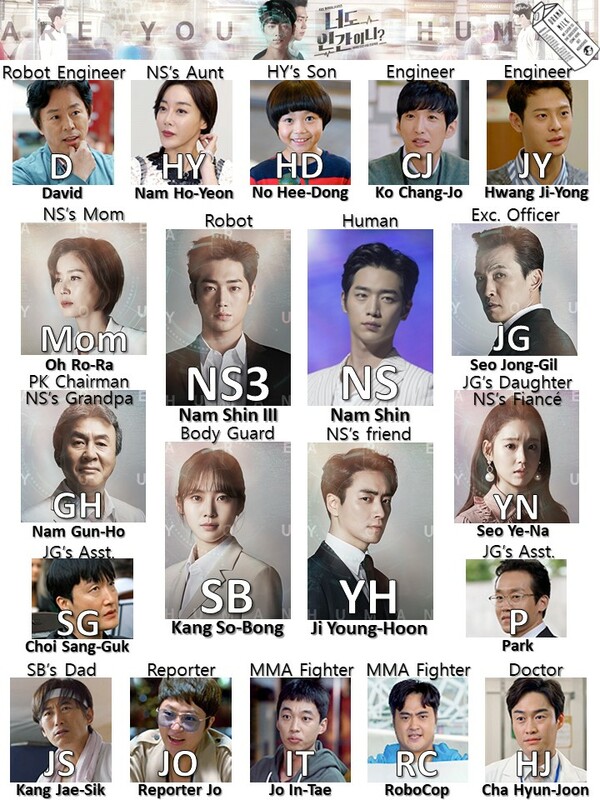 I was starting to get the feeling that Nam Shin should not want to be a human, he should just want to be a robot because it is cool to be a robot, too. I am so happy that SB told him that and that he had a big confident reveal at the end. Now can we just get rid of that Kill switch, because it is not good for my nerves. Shin – Hyung, how can you do this to me? Just give me an excuse! Umma – This is a ticket to the Czech Republic, lets go with Umma. JG – Are you crazy! YH – Why don’t you at least sit here. Shin – Kill switch…hey, there is a way to destroy you. Thanks for the recap! It’s Medical in M-car, When NS3 was in a meeting with his team with Halabogi he said it was medi-car, so M-Car. On that basis I assume its medical city as well. & OMG OUR ROBO BABY CAME OUT! So much love for this drama! I want to know the ending but at the same time I don’t want this to end, hahaha. I hope in the end both Shin and NS3 will live happily and Shin will eventually accept NS3. On the other hand, fell in love with KSJ in this drama 🙂 Thank you very much for recapping…until next episode. can i know which bgm they used for the ending scene- NS3 revealed himself at the shareholders meeting?